Made this for our dinner party with friends last night.... it was so good and refreshing! BEAT milk and pudding mixes in large bowl with whisk 2 min. Stir in 1-1/2 cups COOL WHIP. Reserve 1/4 cup berries for garnish. ARRANGE 21 wafers on bottom and up side of 2-1/2-qt. bowl; top with layers of 1/3 of the pudding mixture and half each of the berries and remaining pudding mixture. 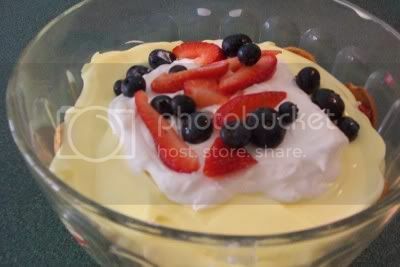 Top with layers of remaining wafers, berries, pudding mixture and COOL WHIP. Garnish with reserved berries.